The Republican primary was the tea party's last chance - albeit a distant one - to beat an establishment incumbent this election year. Despite picking up endorsements from conservative powerhouse Sarah Palin and the Tea Party Nation, it was an uphill battle for Carr, who trailed the two-term senator in the polls. Alexander thanked Carr and the other candidates from his campaign headquarters Thursday night and quickly turned the focus to November’s election. Carr had staked his campaign largely on Alexander's stance on immigration, slamming the two-term senator's vote last year for the Senate's comprehensive immigration reform bill - legislation that ultimately stalled in the House. Alexander was among 14 GOP senators who voted for the comprehensive bill that Carr contends amounts to amnesty for undocumented immigrants. The issue of immigration is back into the national spotlight as a surge of unaccompanied minors from Central America are crossing the U.S.-Mexico border, flooding emergency facilities and igniting a debate in Washington over what to do with the latest influx of immigrants. As Congress and the White House lock horns over the border crisis, Alexander, known as a lawmaker willing to work with Democrats to broker bipartisan deals, recently aligned himself with tea party star and Texas Sen. Ted Cruz on the issue. Alexander's campaign hadn't taken any chances from the beginning, running campaign ads as early as last July before he had any primary challengers. 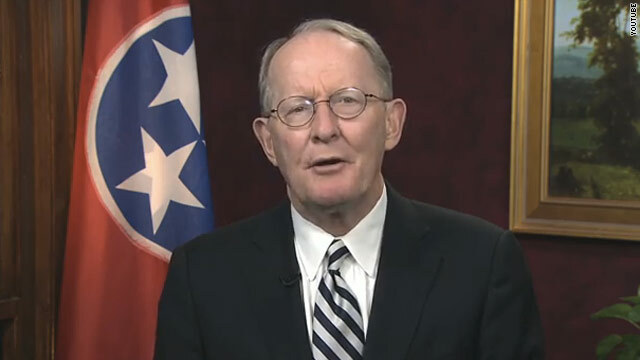 Carr had also made a push for defunding Obamacare, as well as arguing Alexander is out of step with Tennessee voters. The state representative was originally planning to challenge Republican Rep. Scott DesJarlais in Tennessee's 4th U.S. Congressional District, but dropped his bid in order to take on Alexander. Carr's campaign received a jolt of enthusiasm after little-known professor David Brat upset House Majority Leader Eric Cantor earlier this year in Virginia's GOP primary. Then, longtime Sen. Thad Cochran of Mississippi was forced into a runoff against tea party challenger Chris McDaniel after initial primary results were too close to call. Cochran narrowly beat McDaniel in the runoff but the challenger's campaign is contesting those results. "Make no mistake about it - the fight that Chris McDaniel started in Mississippi will continue here in Tennessee," Carr said after the Mississippi runoff. But unlike McDaniel, polls indicated Carr was the distinct underdog to Alexander. And, aside from the ongoing vote battle in Mississippi and Brat's unexpected victory over Cantor, the establishment wing of the Republican Party has come away from this election cycle relatively unscathed. Five other lesser known candidates were competing in Thursday's GOP contest in Tennessee, a factor Alexander benefits from as grassroots support is divided behind his leading challenger. Alexander will go on to face one of four Democrats and a series of third party candidates in November's general election, though the seat is considered a safe bet for Republicans. CNN's Ashley Killough, Paul Steinhauser, and Jonathan Helman contributed to this report. The people of Tennessee do not want ignorant racist to govern them. You asked for this Republicans. You voted in these idiots who don't know a thing about government except that "it's bad". You liked it when the Supreme Court told corporations that they could have more power than the voter with infinite donations for Republican puppets who care only about deregulating and lowering taxes. You voted for the tea party freaks who promised you that government is the enemy. You voted for people who don't want the job, but would rather have it over someone who actually cares!! It's your fault America. Land of the stupid and home of the blames. You let the angriest and out of touch Republicans of our country take hold of the House of Representatives in a failed pusillanimous attempt to take the entire Congress. You want someone to blame? Look at you pathetic self in the mirror. Look at yourself while you ponder the rights you took away from gay people just to garner some votes out of the bigots. Peer into your selfish eyes while you consider all the religious people who think life begins at conception but ends at birth and their anger that was exploited simply to get people who hate government in government. Republicans leaders aren't to blame; they told you strait to your face that they had sold their souls to the highest bidder. Republicans voters are to blame, every last one of you, from the fake "fiscal conservatives" all the way down to the angry people hating "social conservatives". You are all playing the fool and one day you will all be forgotten.